more info King Rama I made Chinatown a center already in 1782. Today as before, a beautiful continuous line, bustling with activity, crowded with people, a colorful commercial hub, and of course, a foodies paradise. This is where you want to squeeze down just one more serving, after your stomach reached full tilt one hour ago, already blaming you for overconsumption. But of course, Chinatown is so much more then jut another dish, another experience. It’s a rush. 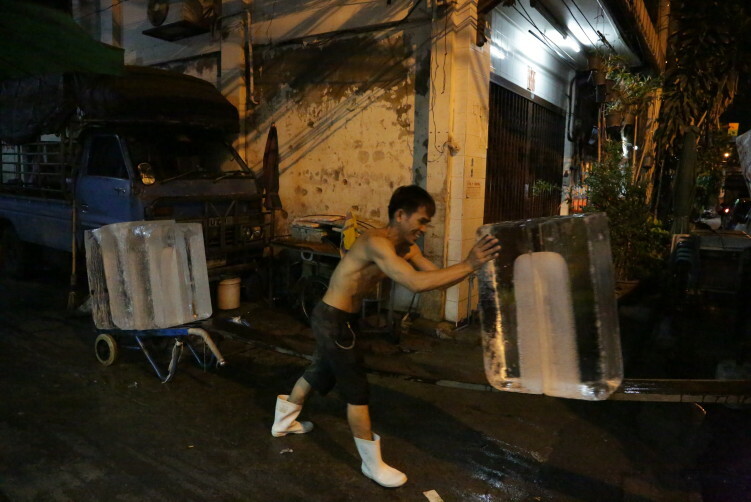 And the main vain running through this pulsing, chaotic and vibrant part of the city is Yaowarat Road. 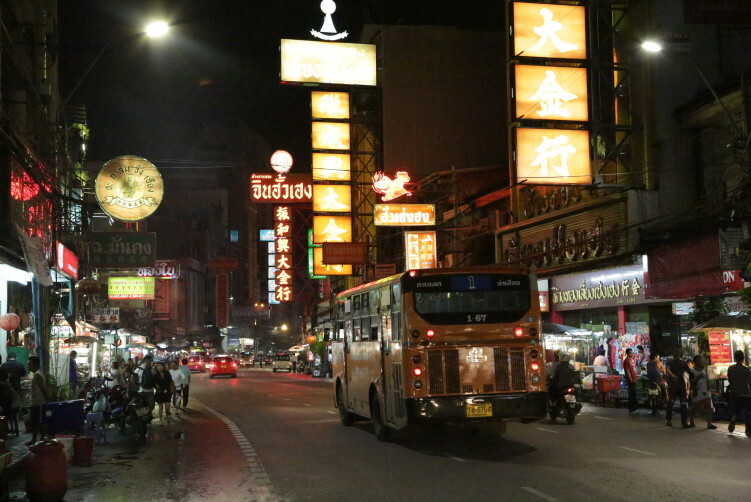 What looks like a massive amount of business signs at daytime hours, mostly written in Chinese and Thai, turns into a war of neon lights in the evening. Pretty? Maybe not, in the conservative sense of the word – but quite cool if you’re in the mood. Energetic and tiring, but at the same time fulfilling and inspiring. I’m afraid Chinatown still makes a mark on you, even if the glories days of the past are gone, as voices in the older generations claims. But what doesn’t change? You won’t find opium dens in these postmodern times, but you still get a decent cocktail. Sometimes even a decent dose of Jazz (Changhai Mantion), bringing some of us back to the more blue parts of the previous century. 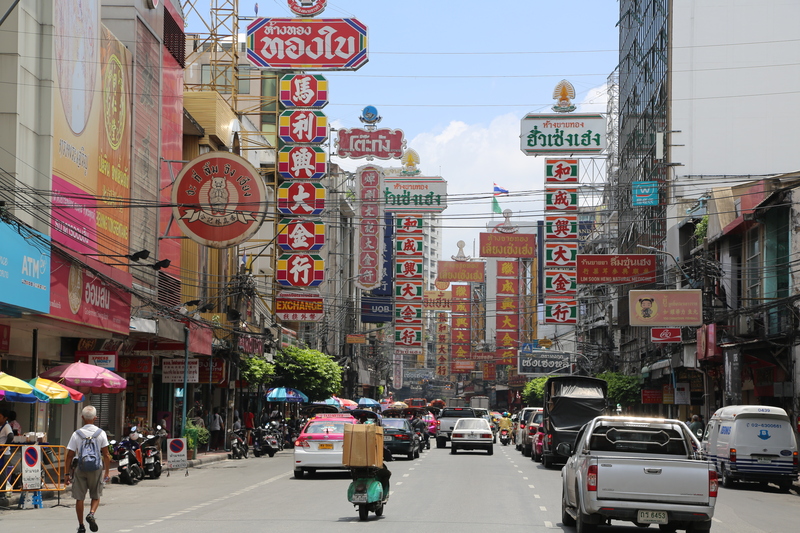 But despite modern influences, including gas driven taxies and capital demands exceeding any level of decency, Chinatown and Bangkok still has what many other cities and countries doesn’t have. It quickly gives back to you, and it does it plentiful. It leaves you with a tattoo of minds saying cool. And no matter what you think before going there, you will remember it and think about next time as you try to buy into your ordinary life after returning to your home with a non-flexible flight ticket – regretting you only asked for a four week leave and not a full year. But that’s life. And you won’t do the same mistake again. If you don’t feel any regrets, you went to the wrong places, but that will be for another article. At some point you start thinking about where and what to eat while the war of neon lights bombs your retinas. Green and pink taxis cuing up everywhere, as do the red and yellow buses, grey air-coned vans shuffling lazy tourists, and of course noisy diesel spitting tuk-tuks in any shiny colors you can think of. And a few more. It’s a beautiful ball of madness, especially after the majority of food stalls have taken over the pavements after 6.30 p.m. It’s crowded. It moves, but slowly. You’re passing one non-familiar dish after the other, triggering your senses, challenging your skepticism and makes you think what the hell do I eat here? But don’t get stressed, just relax. It really gets worse, but in a good way. As long as you stay open minded. Soon you join the crowds, follows the speed, the tempo, the locals, you order what the couple next table orders, drinking what they drink, slowly taking in the atmosphere and step by step turning into a Yaowaratian, if there is any such thing. If not, so what? And even if you don’t challenge a few chicken feet’s sticking out from a bowl of noodles, you slowly start to deviate from your regular me. Believe me. So just beat it. Be bold. And of course, don’t hold back. Chinatown has plenty of most things imaginable when it comes to food. And really to much to cover in one article. Therefore, I have split the coverage of Chinatown into two articles. This one will cover the food along Yaowarat Road, while part II will cover the other areas of Chinatown, including the small sub-sois. 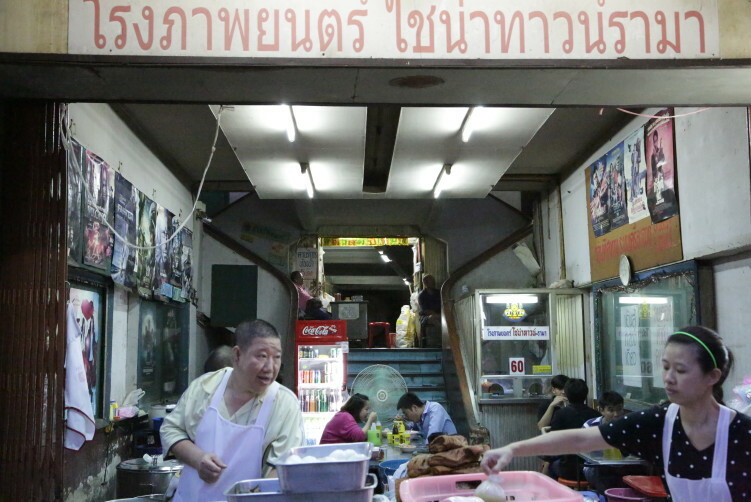 A general recommendation is still to use Yaowarat Road as your fixed point for orientation when in Chinatown, also for vendors covered in part II of this article. 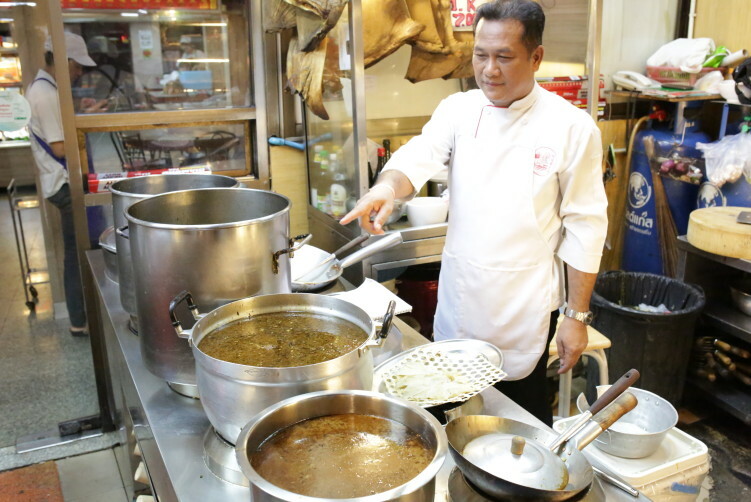 Yaowarat Road, and Chinatown in general, is known for serving high quality food, not only because of the competition in the area, but also due to vendors own pride in delivering the best food they can come up with. Nobody needs to settle with the next best in Chinatown. So be sure to come hungry and prepared for diving into an incredible number of astonishing tastes and aromas that invite your taste buds on to a roller coast you never dreamed of. Guaythiew Lod serves fantastic stuffed flat noodles. The best advice is really to keep your senses alerted and follow them. If it smells good, it most likely tastes good. This article is not a complete guide, but to give you some ideas and examples. A long time favorite among both locals and visitors is Guaythiev Lod, a stall in front of the Seiko shop at Yaowarat Road, a short walk from the hotel Changhai Mansion and next to La Scala shark fin restaurant. The cart serves some of the best stuffed flat noodles (Guaythiev Lod) there is. 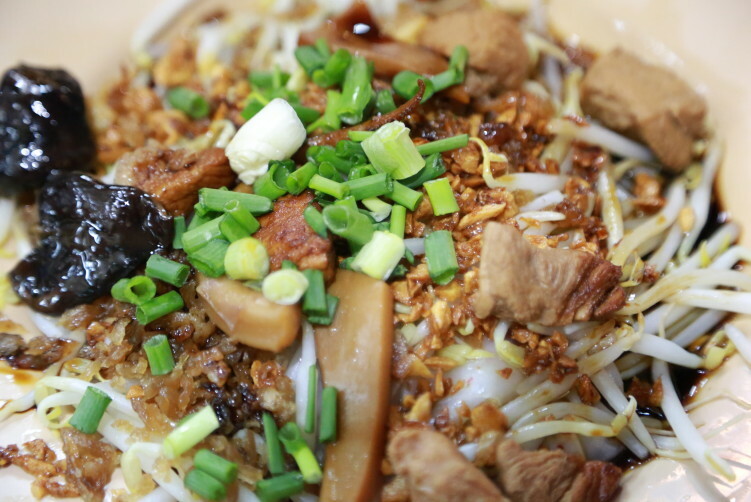 It’s a Chinese-style delicacy were rice noodles are mixed with pork, shiitake mushrooms, squid and bean sprouts. They top it with scallion and deep-fried garlic and then bath the whole thing in a soy-based sauce, giving it a nice salty tang. The added bonus is those tiny dried shrimp you find embedded in the noodle dough. You can order it with an egg (sai kai), or without an egg (mai kai) – I recommend to bring on the egg. The stall is open from 6:30 p.m. to 1 a.m. And they don’t have Mondays. Be prepared to cue, but it’s well worth it. And don’t forget to use the condiments (chili, vinegar with pepper and Chinese black vinegar) to adjust the taste, but please taste the food before throwing it all in. It’s an unusual dish, and many westerners will be sceptic, but please give me a break – dig in or walk back to the MRT. If you’re not ready for it, visit your mum or you’re regular pizza vendor and read something else until you decide getting on board the route of experiencing life. Another must try dish along the Yaowarat strip, and also one of my addictions, is Kuay Jab. I couldn’t live without it. 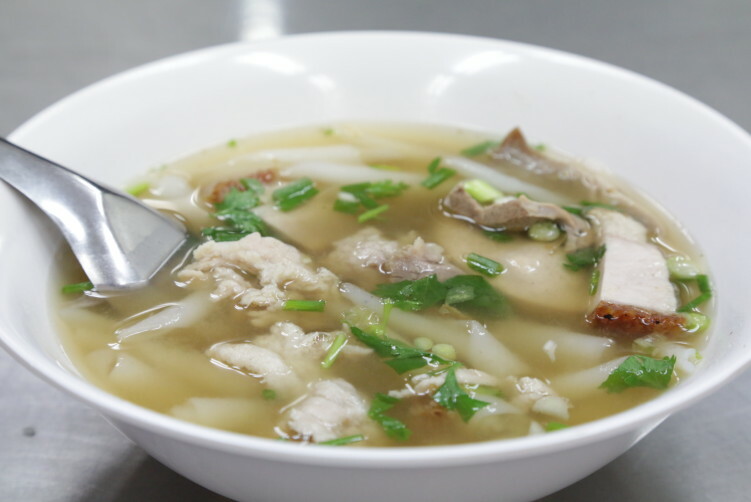 The noodle soup comes with different cuts of pork and has its origin in Southern China, but as with many other dishes typical for Bangkok’s Chinatown, Thai’s are doing an excellent job in adding their own touch to make it their own, giving it an unmistakably Thai flavor. It’s heavy on spices, but not chili as you might think. We’re talking about the crown of peppers. The white once. As with so many other dishes in Chinatown and the rest of Bangkok, there’s plenty of variations from one vendor to another. But the peppery broth is a constant. Light variations of the dish normally adds up to garlic, lettuce, fresh herbs like cilantro or tofu where the herbs or tofu is the most common once. Nai Ek at 442 Yaowarat Road is one of my favorites. Other favorites are Nai Lek Uan at the intersection of Yaowarat Road and Soi 11 and Uan Phochana at the entrance to the old theater. The last one serves a slightly less peppery version of the dish. Pa thong ko, or tiny fingers of crispy deep-fried dough, is a standard topping. If you prefer to leave the offals out, just say “no inside”. Be aware that you will not spot Uan Pochana (see picture) from the street before they open up around 5 to 5.30 pm as the entrance to the old cinema i s closed with boards daytime due to construction work inside the building. A delicious bowl can be found all over Chinatown. Hua Seng Hong (371-373 Yaowarat Rd) is a popular spot among Chinese, known for their genuine and authentic Chinese food (Teochew Chinese style). They have a wide variety of dishes to choose from, including dim sum, roasted duck, braised goosefeet in a clay pot, steamed crab with glass noodles and other seafood dishes. And the food is good, including the dim sum, the roasted duck and crab dishes. If you want to show nature and sustainability your ugly finger there’s an option to dig in on bird nests and shark fins – almost as integrated into their food as tuna is for Japanese. The Dim sum is by the way quite popular and tends to run out in the early evening. The kitchen is outside, and the environment is a bit sterile and back to the 80s. If that isn’t enough, the waitresses can sometimes be a bit brusque – not really to be hold against any Thai or Chinese restaurants in Bangkok. There’s no such thing as appetizers and main courses. The food comes in one go or when it’s prepared. 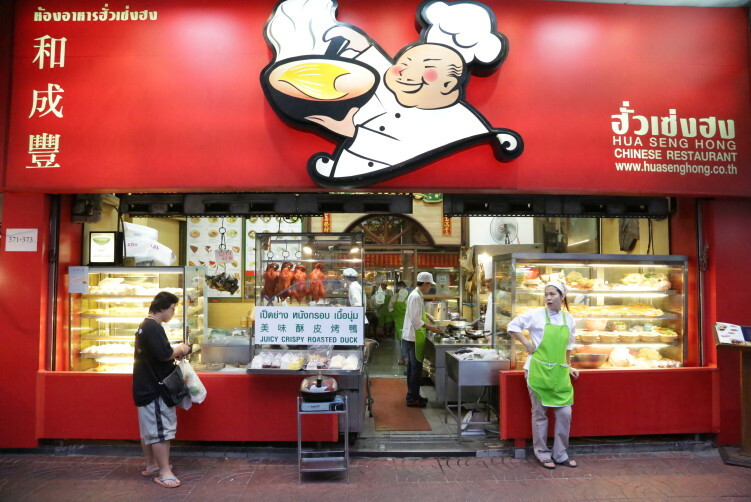 Sometimes there’s a need for traditions to change, but don’t expect Hua Seng Hong to take the lead. Another spot to look up if you’re in for some crispy pork or barbecued pork is Nai Jui. Absolute one of the better vendor of the dish in Chinatown. The really tasty pork parts comes with rice, a thick (slightly to) sweet sauce and some slices of cucumbers on the side. Thai’s have a sweet tooth and many vendors all around Bangkok ruins this dish because of that, but Nai Jui stays just inside what’s acceptable. It’s a morning and early lunch spot and you find the cart a few steps away from Xia Shark Fin at 450 Yaowarat Road, in other words close to the corner of Phadungdao Road, that crosses Yaowarat Road on both sides. They also have braised pork legs. Crispy pork is my favorite here, but both the barbecued pork and the braised pork leg is also very good. A day spent exploring the endless alleyways of traders and vendors is culturally stimulating but physically exhausting. That is why Double Dogs Tea Room proves such a welcoming harbour from the frenetic pace of life outside. Excellent little tea house to take a break from the heat and noises of Chinatown. Highly recommend. It’s open Tuesday to Thursday: 13:00 – 21:00 and Friday to Sunday: 13:00 – 23:00. 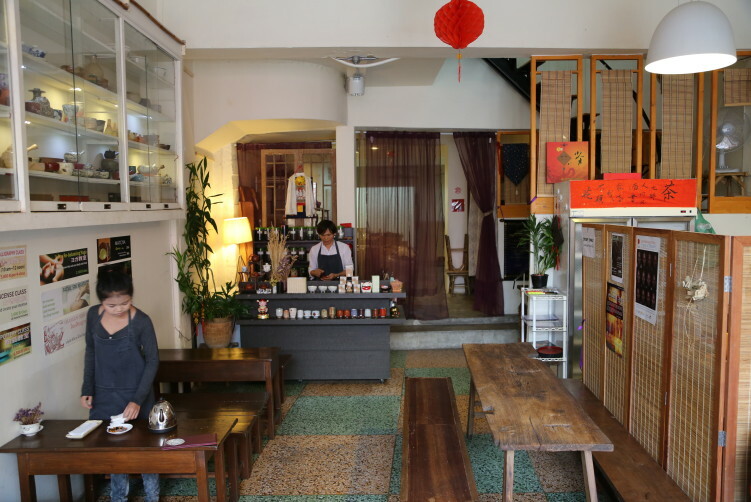 This air-conditioned shophouse on Yaowarat serves a range of premium teas and Chinese cakes with all the pride and ceremony of a traditional tea room, and yet it is a casual hangout for weary visitors and more than the odd local too. Double Dogs Tea Room The decor is fairly simple, but spotlessly clean and everyone is given a heartfelt welcome by the owner, appropriately named, Khun Tee, and his staff. 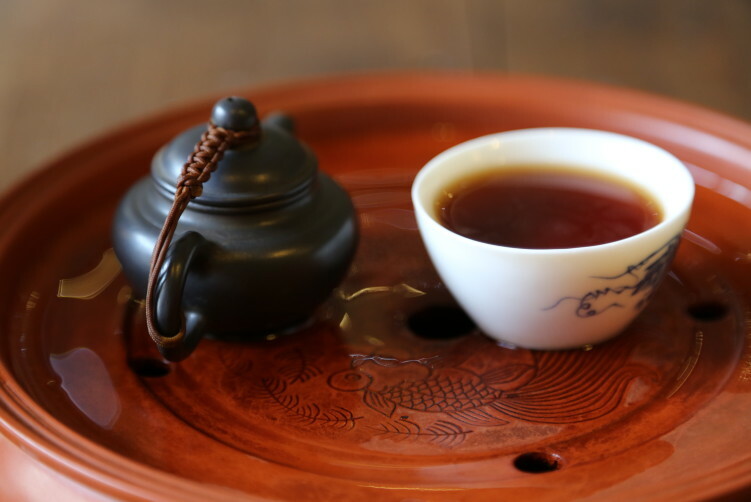 For newcomers to the world of tea, the menu is informative and easy to read, with separate sections on different tea types and regions. Many will tell you that T&K Seafood is the best place to visit, and you might suspect it actually is when you see the cuing starts before the shop opens up around 5 pm. See my full review on T&S Seafood before you listen to any recommendations for this place. I had Tom Yam Kung, the famous Thai shrimp soup, and a whole steamed sea-bass with chili, garlic and what should have been a limy stock. Conclusions: A completely overcooked fish served with a stock that tasted like dishwashing water and a bowl of Tom Yam Kung (soup) that was just sweet and completely unbalanced. A hungry cat would turned away from the food they served me. T&K Seafood is, at least when I visited it, the definition of a tourist trap, and that might also be the reason why you won’t find any Bangkokians or locals eating there. 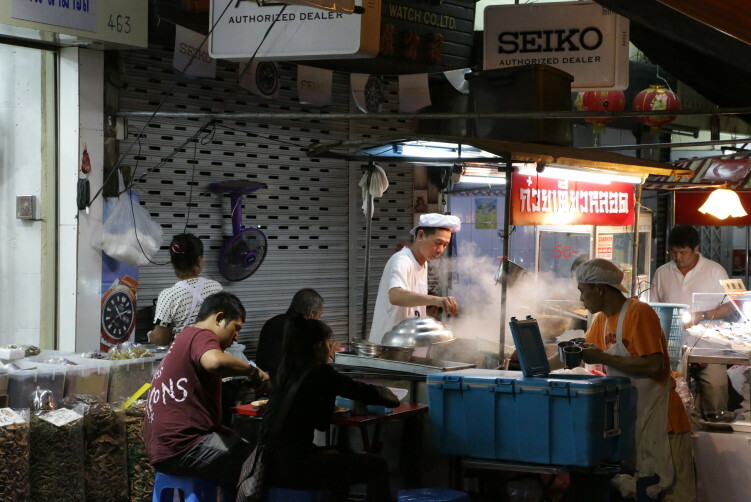 There are of course other good options and stalls along Yaowarat Road, but I have tried to give you some of the best options along Yaowarat Road. In part two, where I will move into all the sub-sois of Chinatown, you will be given quite a substantial number of recommendations on where to eat. It’s definitively not like 1782 or the 1930s, but it’s certainly not 2016 either. Chinatown is a small world on planet earth. They live by their own measurements, their own customs and principles. I presume it’s what academics would call a sub-culture. That is also, together with all the great food, what makes it worth a destination in it’s own. You should consider a stay-over. The choices for a decent room isn’t as obvious in Chinatown as in other parts of Bangkok. 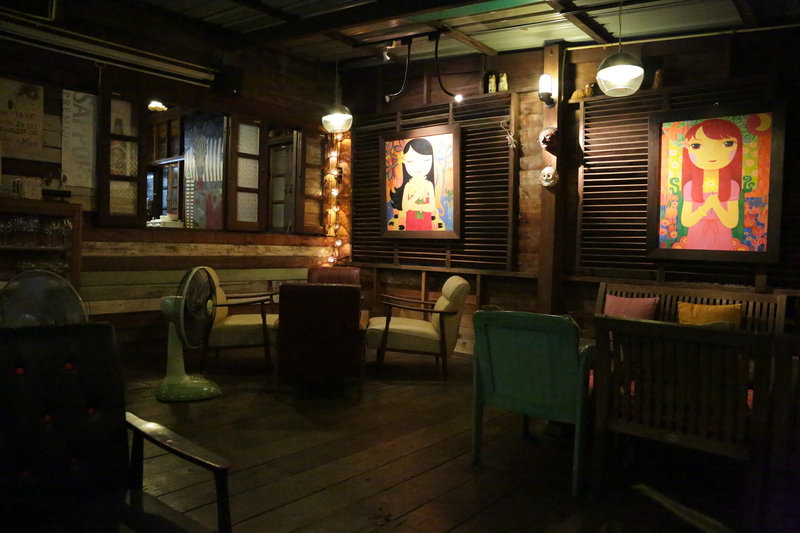 Changhai Mantion in Yaowarat Road doesn’t have a swimming pool, but it has tons of atmosphere in combination of being the perfect starting point for your food journey. They also have decent live Jazz music in the small coctail bar at the entrence of the hotel. Personally, I prefer Chinatown during wintertime, as it isn’t as humid as in summertime or the rainy season. I recommend using Yaowarat Road as your fixed point for orientation when in Chinatown. It is the parallel to the much bigger Thanon Charoen Krung. Click on the Chinatown tag to get more options and directions. How to get there: There is no Skytrain (BTS) or underground (MRT) in Chinatown, but they are building one in Charoen Krung close to Yaowarat Road. That doesn’t really help you today, so until then, one option is to take the Metro to Hua Lamphong, 6 metro stops and 12 minutes away from MRT Sukhumvit station, which also interlink the BTS station Asoke (Terminal 21 shopping centre). If you take the BTS Silom line you can change at Silom and take the MRT from there, 2 stations heading west. You will for sure prefer that to a taxi in the rush hours. If you take a taxi from Hua Lamphong, insist on using the meter (as elswhere in Bangkok). Hi, I really like your site so much and I have use it as reference where to find the best food in Chinatown on my last trip to Bangkok. I went to Hua Seng Hong and truly, the food did not disappoint. If I was not that full, I would have ordered more. I’ll make sure to consult your site again when I go back to Bangkok next time. Best of luck! Thanks a lot! Glad to hear you enjoyed the food. All the best.